He hated how he felt and decided one day to 'just do it.' What he did was drop 27 percent body fat and go out to continuously change lives. I was 38 years old, a father of two wonderful girls—ages 2 and 4—and I could not keep up with them. It's one of those things when you feel like your life is in shambles—physically, spiritually, and mentally. I remember trying to tie my shoe one day and feeling so dizzy simply from my gut pressing into my knee. From my knee to my back, everything ached. I looked in the mirror and couldn't stand to see myself. "Look how you've fallen," I said to myself. I was sick and tired of, well, being sick and tired, so I did something about it. Today I can outrun my kids and most adults. My children see me as a kid and I feel like one, too. As much as I had willed and forced my physical body to change, I never realized that my mind and spirit would be morphed on my transformation journey as well. My thought patterns changed in such a positive way. Before, I dreaded the daily routine of life, but now I jump out of bed, smiling at the world around me and basking in the moment. Life is short; why not do something today? It's kind of like Nike's famous slogan: Just do it. I woke up one day, didn't want to only think about changing, and just did it. At first, I started with not giving myself an option when it came to hitting the gym or eating well. I trained with a newfound intensity and determination six days a week. On days I didn't feel like training, I compromised by running 3 miles while watching "Two and a Half Men." For me, the bottom line was that training would not merely be an option; it was mandatory. I wanted this so badly that nothing and no one would stand in my way. I kept detailed logs of what I ate and discovered—through lots of trial and error—the right combination of nutrient-dense foods. My inspiration came from within, and I focused on being a better person, a better father to my children, and a better version of myself who can contribute positively to society. I firmly believe that nutrition is the key to stimulate and maintain healthy bodies. I want only what's best for my body. Of course, I'd eat out a lot and cheat here and there (after all, it's hard not to eat out with friends). My diet is a balanced mix of protein, carbs, and fats. At times when I feel not quite myself, I will track my nutrition for two to four weeks to get back on course. For me, food is a source of fuel, not as much a source of pleasure for now. But you can eat clean and healthy and still enjoy it. I followed this plan the first four months and then added more and more to the routine as I got stronger and more capable. I trained three days on, one day off, and reset the training cycle. "Slow and steady results are the best as they will stay with you longer." Truthfully, the primary challenge was doing cardio in the beginning just because my cardiovascular system was so out of shape. I really needed to talk myself into actually initiating my cardio routine and maintaining it for at least thirty minutes for the first six months. That was difficult for me, but I loved the eating and doing the weight training. My current plan is to compete in the National Ruby Championship again this year and to continue to build my training business. I'm particularly proud of the fact that I took third place in the men's physique masters (over 40) category last year. Educate yourself in nutrition and exercises, but do not follow the latest trends. Slow and steady results are the best as they will stay with you longer. Remember that nothing worth having is ever easy; you must sweat to earn it! Once I posted a few pictures of my transformation journey, I was overwhelmed by the response and the support I got from other members of BodySpace on Bodybuilding.com. This encouraged me to go on. By the same token, I was continuously inspired every day by other people—and still am! I also turn to Bodybuilding.com for fresh ideas on new workouts and great nutritional information. 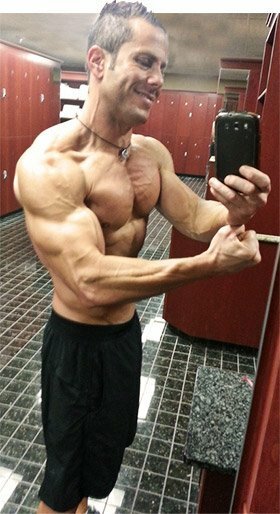 Most of all, Bodybuilding.com is my source of inspiration from the many transformation success stories. We all keep it going by inspiring each other. You never know when one person's story will positively affect someone who desperately needs it.